I was really looking forward to reading Words in Deep Blue by Cath Crowley, as I had seen nothing but good things about the book, and the summary had me super curious. This book was a really quick read, and I ended up enjoying it so much more than I expected to! Can I start off first by saying how much I LOVE the setting of this story? It's in a BOOKSTORE!! (Or, bookshop, as it is mentioned in the book. *Grin*) Why are more books not set in a bookstore? Or even a library? This was a secondhand bookstore as well, and I loved all the details about it, especially the ____, where you could share thoughts and notes in books that other people have shared in as well. This was awesome, and I'm totally not doing a good job of describing what it actually is, so read the book for yourself to know more about it! There were a lot of characters in this book to like, including the two main characters, Rachel and Henry, who used to be best friends, but drifted apart when Rachel moved away. Now she's back, mourning the loss of her brother, and working in bookshop with Henry, who is trying to cope with the breakup of his long-time girlfriend. (He's not doing a very good job of it, should I add, and I don't like the girlfriend at all.) Both Henry and Rachel have some pretty great friends and family members that we meet throughout the story, and I really enjoyed them as well. 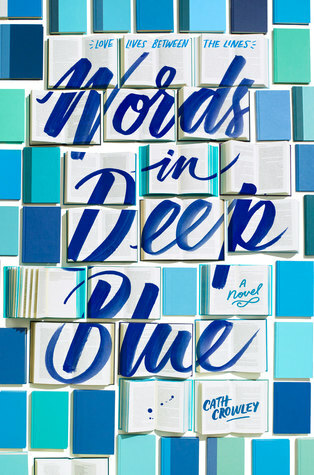 Overall; Words in Deep Blue was a really interesting read, and I'm glad it found its way onto my TBR this month! It's definitely one of those books that you'll remember long after you finish it, and will make you want to read even more by Cath Crowley, which I'm looking forward to doing in the near future! Oooh I love books about bookshops with booklove. Sounds so great, added to my TBR! Have you read How to find love in a Bookshop? So nice as well. This book was so beautiful. One of my 2017 faves. The bookstore was awesome, the book talk was awesome. It was happy, sad, funny, and everything in-between. Loved it to shreds. Ahh, so happy you enjoyed this one. Really, desperately wanting to read it. I, too, think book stores need to be the setting of more books! And the dynamic between Rachel and Henry intrigues me so much. If you're really interested in reading more by Cath Crowley, I highly highly highly recommend Graffiti Moon!